A new episode of The Round Table podcast is up on The Tome Show’s site. This episode is about a great tool for worldbuilding called Realmworks from Lone Wolf Development. Liz Theis is on the Lone Wolf team and she tells us all about the new digital campaign management tool for players and GMs. This passion project was twenty years in the making for the developers and you’ll be glad you learned about it. It’s also just a great chat about worldbuilding and storytelling in general. This podcast was recorded on April 8, 2014. Check out the video below to learn more. This is a great product for any world builder, GM, or storyteller. So check it out! No, they aren’t paying me. I’m just pumped this product exists. So I’m taking a little diversion this post from Exploration Age to talk about the theme of this month’s RPG Blog Carnival. That theme? GM binders. Way, way, way back in the day when I was ten and playing The Fantasy Trip I used a marble composition notebook in which I wrote every whack campaign idea I had (many of which we’re never played). This included an entire campaign based off the James Bond movie The Man with the Golden Gun. The Man with the Golden Hand Crossbow (I was ten) was a rollicking tale and one of the first stories I ever ripped off completely. Here’s to you marble composition notebooks! May you hold young children’s campaigns, MASH games, dot-man wars, and secret crushes forever. Behold! The secret-keeper and math-homework-tracker! My gaming notes today are organized, but usually only in a way that would make sense to me. I’ll use my last campaign as an example. I ran a group of six PCs through a Fourth Edition Dungeons and Dragons Eberron game that lasted from levels one to thirty. The ideas for this campaign began where many today probably do – Google Drive. 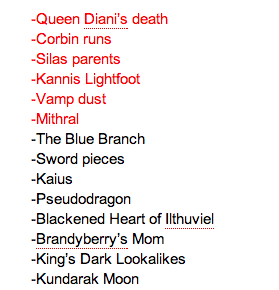 A peak into my Google Drive folder for my Eberron campaign. Why Google Drive? Well there’s a few reasons. First I work on my game in a lot of different places. At home on my laptop, on my phone in the train headed to work, and on my work computer during my lunch hour. With Drive being a cloud I can work on my home laptop, my phone, and my work computer without having to lug too much back and forth. I can easily output word docs, tables, PDFs, etc. to share with my players or print stuff out and bring it to games. Plus, 15GB is plenty of space for campaign notes. In Google Drive I kept a bunch of different documents related to the Eberron game, but they mostly fit into these categories. Campaign Outline – A brief outline of where I think the campaign is going. This is so I can see how things are playing out, what the endgame might be, and what’s happening in the world beyond the scope of the party. I usually update thisdocument every few sessions. 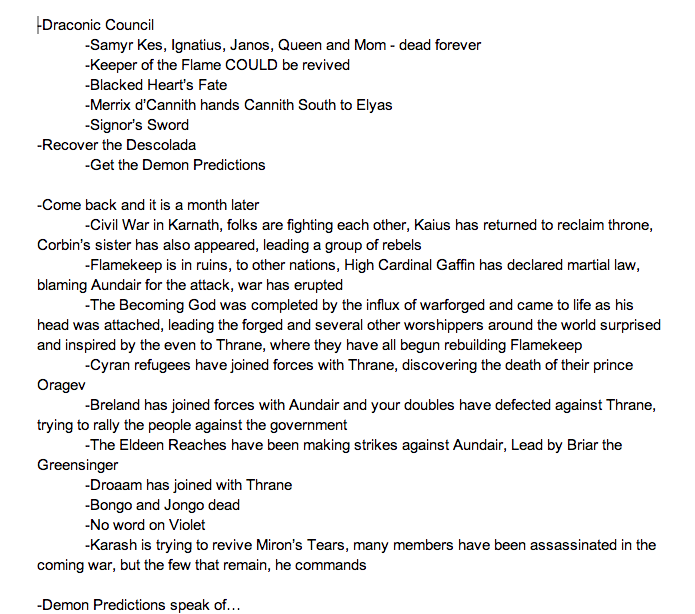 Here’s a look at my outline during ourepic tier of play (forgive any typos, remember, this was just for me). Open Threads – Then I also have a list of open threads (and believe me there were PLENTY in this campaign). Here’s where I list all of the unresolved issues in the campaign. Stories from side quests, character backgrounds, secret dealings, and consequences reverberating from the party’s actions all go here. I leave this open while we play and jot down notes quickly. Anything that gets resolved I highlight in red. Seriously, this is just a PIECE. Weekly Quest – This is where I kept detailed information about what would (might) happen during our weekly session. Monster stats, read aloud text, traps, NPC statistics, and general adventure information would go here. Here’s another taste. Treasure – If you’ve ever played 4th edition, you know that there’s many a magic item to give out. If a player doesn’t have the right magic items the math for attacks and defense won’t work out. In this case I awarded over 150 magic items (not counting consumables like potions). It’s a lot to track along with gold and monetary rewards so I had a separate document for that. I’ll assume this only makes sense to 4e DMs, but here it is. So those documents help me track what the campaign is doing and where it’s going, and a tiny bit what’s in the past. However most of the past of this campaign was tracked if a different way – via gmail. I’ve tried using Obsidian Portal before, but unfortunately for as much as I loved it, getting my players to use it made taking a dog to the vet seem easy. Obsidian Portal and services like it are awesome, but they’re a ton of work as well and if my players aren’t into it then it’s not worth the effort. My players do read emails. Going to a website and navigating for the answers you want requires more effort than opening and reading an email. Likewise typing an email is a lot less work than managing an Obsidian Portal account. So after each session I’d send an email with the following information – a list of the known quests and tasks they had committed to completing, a brief summary of what happened during the previous session, a list of who was wounded or diseased, a list of rewards gained during the previous session, and an updated quest wiki. 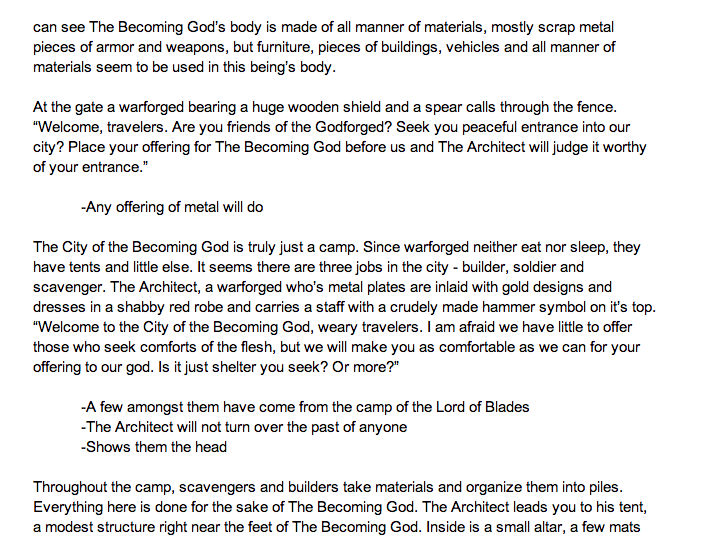 A sample of a recap email minus the wiki. Our wiki was simple and tacked onto each email. It was divided into three categories – people, places, and organizations. Each was organized with alphabetical entries that had no more than two lines of description. I’d simply copy and paste the wiki from the previous recap email then add to it for the current email. It started small and was enormous by the end, but it was a helpful reference for the players and myself. They didn’t have to read it each week, but they knew it was there for them when they needed it. Plus, it was super easy for me. 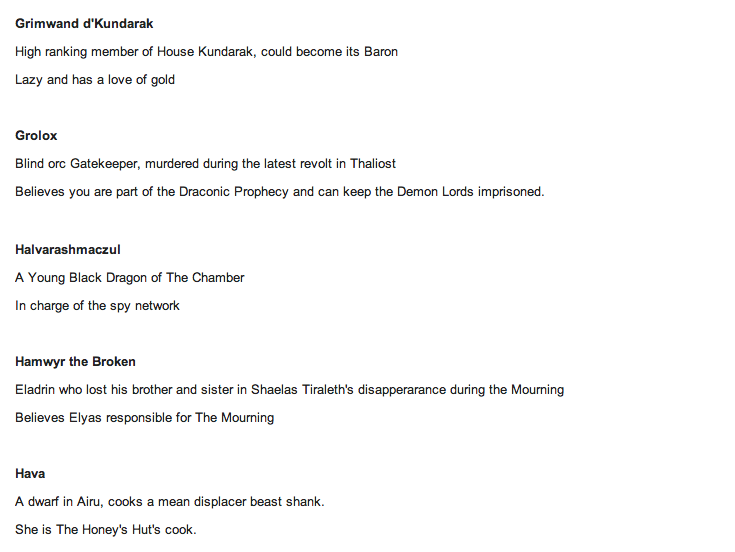 And here’s a very small piece of the wiki, but you get the idea. I’ve already sung the praises of roll20.net, but this is where I kept all my maps for battle, which is super important in a Fourth Edition D&D game. I could archive maps I really loved and might use several times throughout the campaign (like the deck of the party’s airship or the temple which served as their home base). If roll20 doesn’t turn you on, there’s a lot of other services like it. Recently I did a soon to be released podcast interview with Doug Davison of Fantasy Grounds. This product is badass and I highly recommend checking that out as well. The podcast will be released in two weeks, but until then check out their video. Again, through my podcast, The Round Table, I recently learned about a new product for worldbuilding and campaign tracking called Realmworks. Right now this product is only available on PC, which stinks for us Mac users like me. However thanks to the podcast interview with Liz Theis (coming next week) I’ve learned Realmworks will one day be available through the web. When that day comes, I’ll be super excited to keep my GM notebook with that product. It’s full of tons of ways to make prep, worldbuilding, story-tracking, and on-the-fly note taking easy. Check out the video below to get more information about what Realmworks can do. Until then, I’m working on outlining Exploration Age with, you guessed it, Google Drive! 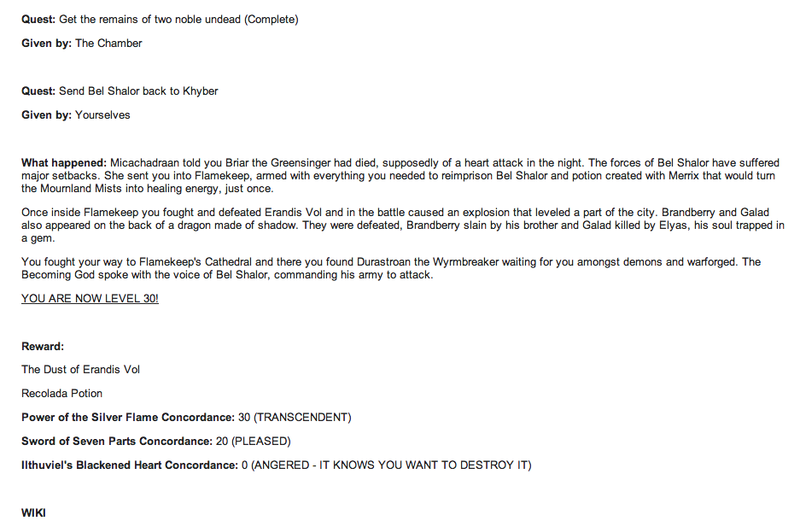 Also, as a bonus in this blog post, I was going through my old notes and I found a Fiasco playset I created for Eberron. It was supposed to be used in the event I couldn’t make a session, but the players still wanted to play something. That never actually happened, but I think it a group could use this playset in a bunch of different ways. Maybe a way to kickoff a campaign or to create a story that somehow ties into an overall Eberron campaign. If you’re familiar with Eberron, the playset is meant to be set before The Mourning in the city of Making in the country of Cyre. Anyway, it’s super niche, but I thought I’d share since I never got to use it. So on the off-chance you love Eberron AND Fiasco, check it out in the link below. Let me know if you actually use it and how it goes! I’d love to know.